I noted that Harry Potter and the Chamber of Secrets was largely more of the same as The Philosopher's Stone, undoubtedly a situation not helped by Williams having insufficient time to compose new music for the entire film. Despite what seems an equally crowded schedule (Spielberg's Terminal literally due only weeks later), Williams was able to pen Prisoner of Azkaban's score in its entirety and for that, we should be extremely grateful. Unlike Chamber of Secrets, Azkaban has both a respectable level of novelty and a genuine darkness that is quite a refreshing change after the occasional sentiment previously. That Hedwig's Theme doesn't appear every 13 seconds is also a measurable improvement; nice though it is, the brief (and rather inevitable) reprise for the prologue here is enough to launch the listener back into Rowlingland, but soon after Williams is bouncing off in new directions. After the delightful Aunt Marge's Waltz, The Knight Bus swerves violently in unexpected directions (as it were) with a wild fusion of Attack of the Clones' dizzying Chase Through Coruscant and the jazzy free form of Catch Me If You Can. Its unexpected rhythms take a bit of getting used to, but it's the best music for a purple triple decker London bus I could imagine. So there. As with the score, the trailer made little use of Hedwig's Theme and it's the Elfmanesque song Double Trouble that everyone remembers and pleasingly, the film version is a little extended and a delightful addition to Williams' engaging selection of movie songs. The theme is used elsewhere and makes a little light heartedness out of the darker hues. It also highlights the early music instruments of the Dufay Collective who add a medieval atmosphere to some of the more intimate and lower key cues; an extension and evolution of the Diagon Alley music from the earlier films. Perhaps the most exciting revelations are the action sequences which, in line with the general atmosphere, are more intense and wild. Williams seems to be moving away from the quite broad orchestration style that became a trademark of his 90's scores and continues the trend toward the kind of intricacy for which he became famous and that is now becoming more frequent, most notably in Anderton's Great Escape from the otherwise rather dour Minority Report. Even the now obligatory Quidditch Match is approached with a renewed vigour, the composer much more attuned to the breathless excitement and danger of Rowling's sporting invention, rather than the more light hearted, heroic treatment previously. Elsewhere, standouts include The Whomping Willow, which includes a subtle hint of Hedwig's Theme beneath the scurrying orchestration, while the second half of the cue, The Snowball Flight, turns in some of the score's most playful material. The same can't be said for the hair raising Werewolf Scene where the brass snarl and the dissonance is piled on thick. Intense stuff for a supposed family film. The Dementors Converge is undoubtedly the darkest point with spectral chorus and dissonant brass that isn't far removed from some of Close Encounter's more disturbing moments. After a turbulent start, the Finale reprises the gorgeous melody for the Patronus Light (which appears all too fleetingly a few tracks previously), before a slightly downbeat conclusion. Mischief Managed ends in fine style as a grand suite of the whole score, including almost all of the new themes - notably a grand orchestral reprise of Double Trouble, as well as the vocal version - plus brief reprises of some of the more familiar ones. In many ways, Prisoner of Azkaban is a more interesting score than its predecessors and bears up better to repeated listening. True, it is perhaps a touch disjointed, but that's largely a result of the wealth of new material that Williams brings, but it's pleasing that he's moving forward with the series rather than endlessly reprising Hedwig's Theme with a token new theme. With no more Lord of the Rings, likely to be the blockbuster score of the year. A dark and exciting delight. John Williams returns after a year long break from the film music scene with one of his best scores in years - Harry Potter and the Prisoner of Azkaban. 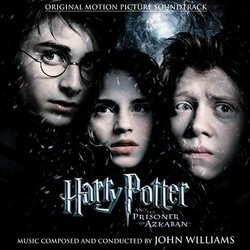 Arguably the best film in the series, so far, the score is also easily the best of Williams's three Harry Potter scores. Alfonso Cuarón's Potter film is darker and more gothic than the two previous films, and this goes for Williams's score as well. Unlike the score for The Chamber of Secrets, which pretty much was a rehash with some new material thrown in, the music for The Prisoner of Azkaban is refreshingly new and inspired, although never really abandoning its roots. The Tchaikovsky influences - especially The Nutcracker Suite - are strong here as well, with lots of celesta and playful woodwinds, but Williams takes his music further, leaning more on new themes, than on already familiar, established ones. The Prisoner of Azkaban is not littered with quotes of the now classic main theme (for some reason always refered to, by Williams, as "Hedwig's Theme". It is, after all, never really used to represent Potter's owl), although the celesta based melody of course crops up from time to time. Instead, the score revolves around several new, excellent, themes, with the wonderful "Double Trouble" theme serving as the score's main theme. It appears in many guises throughout the score, but there are mostly two appearances really worth mentioning - the choral version, also heard in the trailer, and the one performed by Renaissance instruments ("Hagrid the Professor"). The latter, especially, is really lovely and when you think about it, it's actually surprising Williams hasn't written any music like this for the Potter films before. The style is after all just perfect for the world of Harry Potter. There's also a soaring, typical Williams theme for Buckbeak, and the way this theme is allowed to shine in "Buckbeak's Flight" is just wonderful. A gentle flute theme also makes several appearances. It's quite lovely and very reminiscent in style to the composer's music for Jane Eyre. The darker side of the score is normally reserved for the Dementors, with scary, rumbling and dissonant music in cues like "Apparition on the Train" and "The Dementors Converge". These parts serve as a great contrast to the score's more upbeat moments, such as the incredibly hectic "The Knight Bus" - a fast, loud jazzy cue, reminiscent of Williams's Cantina music from Star Wars. Rather annoying, actually. And weird. "Aunt Marge's Waltz" is a lovely, quite whimsical scherzo sounding little piece. The quidditch music in Azkaban is more serious in style than the music written to accompany the game sequences in the two previous films, with dramatic brass lines and choir. "Quidditch, Third Year" is an excellent action track and one of the disc's highlights. "The Whomping Willow and the Snowball Fight" is another wonderful action track, where Williams really brings the brass and percussion sections to the foreground, with amazing demonstrations of counterpoint. A twelve minutes long suite, titled "Mischief Managed! ", closes the album, reprising the major themes. Unfortunately it seems to be a cut and paste job, constructed with selections from other cues included on the disc. But still, it's a great suite and a perfect end to a perfect score.